You're skating down a hill and you suddenly hit a pothole. Slam! You go head over heels—and oh, how it hurts! Snowboarders, motorcyclists, and athletes know impact pain all too well; many of them wear foam-filled clothes to cushion those inevitable blows. Now foam's not a bad protective material, but it's hot and uncomfortable and, unless you wear a huge amount of it, it doesn't absorb the energy of an impact as well as it might. What's the alternative? If "be more careful next time" is alien to your way of thinking, what about using one of the latest, hi-tech energy-absorbing plastics? They're soft and bendy in normal use (thin, washable, and breathable too), but hit them hard and they instantly turn solid to protect you. What are they? How do they work? Let's take a closer look! 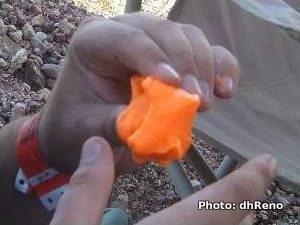 Photo: A blob of orange D3O® feels like putty if you mold it gently in your hand. Hit it with a hammer, though, and it instantly hardens. Photo by dhReno published on Flickr in 2008 under a Creative Commons Licence. It hurts when you fall over because you have kinetic energy that has to go somewhere— and it goes straight into your body. Falling over is a bit like being hit with a large and very blunt bullet. A bullet does damage because, although it's small, it moves with incredibly high velocity, so it has a huge amount of kinetic energy. Your body can't dissipate the energy quickly enough and that's what does the damage. When you hit yourself or fall over, the energy your body has can cause blunt trauma (the medical term for a nonpenetrating injury). With luck, you'll just have bruises; if things are more serious, your internal organs could rupture or you could suffer dangerous internal bleeding. Just because the outside of body looks intact, it doesn't mean you're okay. We've all seen films of medieval knights clanking away with swords and shields. Heavy armor is brilliant for protecting against penetrating jabs—you can't easily poke a sword through a solid sheet of metal—but not so good when it comes to blunter, more diffuse blows. If you're wearing a solid metal helmet and someone clunks it with a sword, a huge amount of energy will still be transferred to your head. The helmet will spread that energy across its entire surface but it won't otherwise lessen the impact: you'll stick get dazed, concussed, or worse. Photo: The modern version of a medieval knight: A soldier tries on "flexible" arm and leg armor designed to reduce injuries caused by explosive blast fragments. Photo by John F. Williams courtesy of US Navy. If you've ever inspected a construction worker's hard-hat at close range, you'll have noticed it's not as hard as it looks. Yes, there's a solid outer layer made of something like polycarbonate plastic. But inside there's a molded foam liner. If a hammer falls on your head from a scaffolding tower, the plastic helps to spread the energy across the whole of your head while the foam compresses and absorbs the impact energy. And hopefully you'll survive! Bicycle and motorcycle helmets have the same two-layer construction. Things like skating knee pads work much the same way: they have a hard, impact-resistant outer cap and an inner, energy-absorbing layer of foam (often similar to the stuff used in memory-foam mattresses). As protective materials go, things like ordinary skate pads are pretty basic: they don't know the difference between a gentle prod from your finger and a sudden smash with the ground. That's bad, because it means they work inefficiently: they're protecting your body even when you don't need it. If you're just walking around or skating normally, they're restricting your movements and slowing you down. Ordinary materials like this behave in broadly the same way to any kind of applied force, however big or small, and obey the basic laws of physics laid down by Isaac Newton, so we call them Newtonian materials. If you double the stress (effectively, double the force acting on them), you double the strain (the amount by which they stretch or bend). Newtonian materials are great in many situations: if you're making something like a mechanical weighing machine with a spring that stretches when you hang weights from it, you need your spring to behave predictably and precisely—in a perfectly Newtonian way—or your measurements won't work. But when it comes to absorbing energy, Newtonian isn't necessarily best. What we need is a material that works harder at high impacts (when something hits us hard) than at low ones (when we're simply twisting and turning our body normally). What we need is a non-Newtonian material! Shear thinning: Ketchup, toothpaste, blood, paint, nail polish, whipped cream, and face-cream start off relatively thick and viscous but become more runny if you subject them to forces. Shear thickening: Cornstarch, custard, many soups, and silly-putty work the opposite way. They thicken up when you subject them to forces. 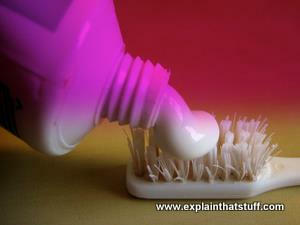 Photo: Non-Newtonian fluids: 1) It might be toothpaste to you—to a scientist, it's a shear-thinning fluid. 2) Severely non-Newtonian and shear-thickening: Lentil soup gets incredibly thick, incredibly quick! 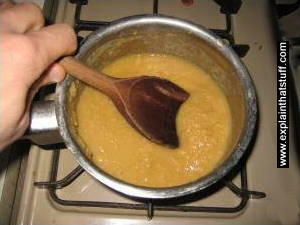 Some non-Newtonian materials are permanently changed by applied forces: custard stays thick, for example. Others are changed only temporarily and revert back to their original form when the force is removed. Ketchup thins when you shake it but thickens up again once it's sitting on your plate. Toothpaste thickens and thins repeatedly: it's thick inside the tube, thins and flows when you squeeze it, thickens back into a gel once it's sitting on your brush, and thins again when you brush it over your teeth. In theory, you could build yourself a pretty decent energy-absorbing suit by knitting yourself some clothes out of custard. It would bend and flex under normal use, but if anyone came over and started hitting you it would quickly stiffen up and protect you. The only trouble is, custard isn't easy to weave and it goes nasty and moldy if you leave it too long. Forget the custard—it's far better to use shear-thickening plastics with long-chain molecules (polymers) instead. They're soft and flexible most of the time, but if you hit them hard they instantly lock solid, dissipating impact energy by spreading it over a much larger surface and absorbing it at the same time. The two best-known commercial products like this are D3O® (an orange-colored plastic made by UK-based D3O lab) and Dow Corning®'s DEFLEXION™ (sold both as a flexible, washable, breathable textile that can be sewn directly into clothing and as a thermoplastic). DEFLEXION, a new brand name for Dow Corning's Active Protection System (APS), is based on dimethyl siloxane hydroxyterminated polymer, which is one of the key ingredients in silly putty (another classic, non-Newtonian material). How do shear-thickening, energy-absorbing materials actually work? Shear-thickening plastics are gels, with long-chain polymers suspended in a liquid lubricant that lets them flow smoothly past one another at slow speeds. Coax them slowly and the chains have plenty of time to slither about, like snakes, and change position; in other words, the material will bend and flex smoothly in response to a slowly and gently applied force. Hit it or try to move it more suddenly and the chains don't have time to rearrange themselves properly. The polymer snakes tangle and lock together, and the liquid no longer lubricates them properly. A smoothly flowing gel suddenly turns rock-hard! 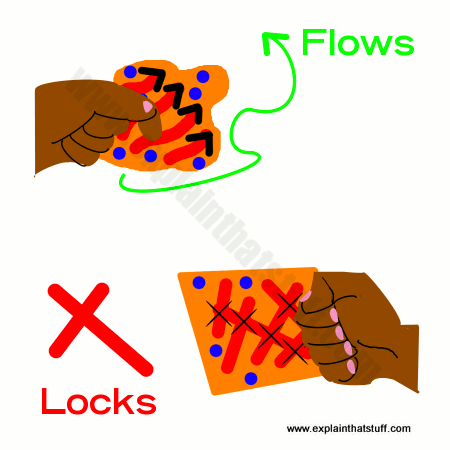 Photo: How D3O works: Top: If you knead it gently, D3O flows like putty: the long-chain polymers (red) easily flow past the liquid lubricant (blue blobs). Bottom: If you hit it hard, it locks: the polymers tangle up and lock solid. Here's a simple analogy. Think of the long-chain polymers like oil tankers and container ships randomly parked in a huge harbor. Suppose you want to rearrange them, very slowly, so they're parked much more efficiently and take up less space. Give all the captains plenty of notice and they can maneuver around one another with no problem: the water between their ships keeps them safely apart and lets them move smoothly past one another into a tighter configuration. But give them just thirty minutes to shift and, in their haste, those giant ships will start smashing into one another, making a solid, gridlocked, mass. Something similar happens if you try to move long-chain molecules in a shear-thickening plastic too quickly. A solid, synthetic rubber (in other words, an elastic plastic) that acts as a "background" material (technically called a matrix), which holds everything together and ensures the energy-absorbing material is self-supporting, without the need for a separate container. A putty-like plastic dilatant (the non-Newtonian, shear-thickening stuff), evenly distributed through the matrix. A fluid, also distributed through the matrix, which acts as a kind of lubricant. This helps the energy-absorbing material compress and return to its original shape (technically, we say it's resiliently compressible). With relatively low applied forces and small movements, the dilatant is free to flow. With higher forces or more sudden movements, it thickens up (becomes more viscous—thicker and slower-flowing), so it begins to absorb energy. With a sudden impact, it becomes rigid. It's not just the changing viscosity of the material that helps to protect you but the way it constantly molds to fit your body. Consider a knee-pad made from a hard plastic. As you move, it's going to shift about, providing a less-effective fit that won't cushion impact effectively. Compare that with a soft, energy-absorbing plastic. Because it slowly bends and deforms as you move about, it's always spread effectively over a large area of your knee. That means any impact force is spread over a bigger area as well, reducing the pressure on your body and the "blunt trauma" damage that it causes. Since the energy-absorbing material helps to absorb (reduce) the impact force, and spreads it over a bigger area, it reduces the pressure on your body in two ways at once (remember that pressure is force divided by area, so less force and more area both help to reduce the pressure). What can you use energy-absorbing plastics for? Everyone from skaters and snowboarders to police officers and soldiers is likely to be interested in energy-absorbing fabrics made from shear-thickening plastics. US and Canadian skiers have been wearing impact-absorbing suits made with D3O for several years now. Ballet dancers, who suffer frequent and painful injuries from all that leaping and landing, are enjoying the technology too thanks to a company called Capulet World that makes pointe shoes lined with a few millimeters of D3O. Skydivers are wearing D3O-lined helmets made by Cookie Composites; skaters, too, can enjoy shoes from Globe with D3O cushioning built into the heels. Dow-Corning's DEFLEXION is used in such things as impact-absorbing motorcycle clothing from Rukka. Apart from clothes, another obvious application is in shock-proof, drop-proof cases for gadgets like laptops, cellphones, and MP3 players; you can find sleeves made with these magic materials from such companies as Tech21. Liquid body armor tested in Poland: Reuters, April 2, 2015. Polish scientists claim to have reduced the body deflection caused by a ballistic impact from 4cm to just 1cm with shear-thickening fluids (STFs). Dow Corning Deflexion textile hits the slopes: R&D Magazine, 25 February 2011. A look at some of the cutting-edge sports gear now using DEFLEXION. 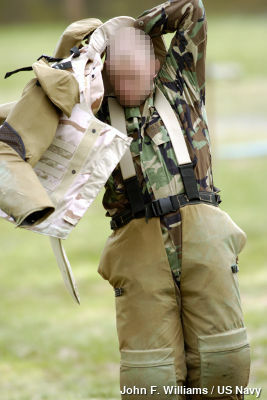 Liquid armour 'can stop bullets' by Victoria Gill, BBC News, 9 July 2010. Describes a new type of body armor made by combining a shear-thickening plastic with Kevlar. MoD considers shock-absorbing goo by Caroline Wyatt, BBC News, 26 February 2009. Includes a short video demonstration of D3O by its inventor, Richard Palmer. What's Up With That: The Bizarre Liquid That Sometimes Acts Like a Solid by Adam Mann, Wired, June 3, 2014. An easy-to-grasp introduction to oobleck (cornstarch and water) and other non-Newtonian fluids. Future Fabric is Fall-Proof, Almost by Ryan Singel. Wired, September 27, 2008. A brief introduction to D3O. SALi—What Is SALi Technology? : British inventor Bill Courtney explains his shock-absorbing material, its numerous applications, and his 30-year battle to bring it to the marketplace. Non-Newtonian Flow and Applied Rheology: Engineering Applications by R. P. Chhabra and John Francis Richardson. Butterworth-Heinemann, 2008. A detailed reference covering all aspects of non-Newtonian materials. Springer Handbook of Experimental Fluid Mechanics, Volume 1 by Cameron Tropea et al (eds). Springer Science, 2007. Roughly 100 pages of this book (in Chapter 9) are devoted to non-Newtonian fluids. All About Physics/Can you feel the force? by Richard Hammond. New York/London: Dorling Kindersley, 2015/2007. This great book (same book, different cover) includes a double-page feature (pp70–71) on non-Newtonian fluids such as custard, ketchup, quicksand, and slime. Designed for ages 8+, though of interest to older readers too. US Patent 8,105,184: System and method of using shear thickening materials in sports products by Herfried Lammer et al, Head Technology, 31 January 2012. Describes a variety of sports products (such as tennis rackets and golf clubs) that use energy-absorbing materials. Impact Response of US Army and National Football League Helmet Pad Systems by William C. Moss and Michael J. King, Lawrence Livermore National Laboratory, 4 January 2011. A detailed technical comparison of a variety of protective helmets made from foam pads, D3O, and other materials. US Patent 7,226,878: Advanced body armor utilizing shear thickening fluids by Norman J. Wagner and Eric D. Wetzel, University of Delaware, June 5, 2007. Describes various defense applications for energy-absorbing materials. US Patent 7,381,460: Energy absorbing material by Richard Martin Palmer, Philip Charles Green, 3 June 2008. Richard Palmer's original D3O patent, filed in 2002. Palmer and his colleagues have also filed US20140303270: Energy absorbing blends (October 9, 2014). US Patent 8,105,184: Bone fracture prevention garment and method by Wilson C. Hayes et al, Beth Israel Hospital, February 4, 1997. A proposed energy-absorbing garment for reducing hip and other bone fractures. Patent WO1997025551A2: Device incorporating elastic fluids and viscous damping by William Alexander Courtney. An alternative description of Bill Courtney's SALi from his 1997 patent. D3O is a registered trademark of D3O. Dow Corning is a registered trademark of Dow Corning Corporation. DEFLEXION is a trademark of Dow Corning Corporation.